A few weeks ago, I found myself in Penn Station at 5 a.m. on a Saturday morning, sipping a disgusting coffee, wearing a cream-colored cocktail frock, and carrying my 30-lb computer bag with a red velvet cupcake in a jar peeping out of the top. It was morning, but it was actually the end of an evening, one that had started at the beginning of the week with a freelancer’s dilemma. I’d received an invitation to the premier of Shark Tank, a television show that shines a spotlight on startup financing. Because I don’t have television, I had never seen Shark Tank, but I’d heard about it from friends. I put off the decision to go for a few days. I was going to have to pay for the trip to New York City on my own, and hope to earn back the money by selling a story somewhere. When Friday rolled around, I was doing OK on the deadlines. I also had something to wear, which is not always the case. And I’d come up with a plan to do the trip on the cheap. If I’d been on staff at a magazine or newspaper somewhere, a trip like this would have been a no-brainer: the contacts would be invaluable, and I’d probably pick up some stories about really interesting entrepreneurs. As a freelancer, it’s a trickier question: how do you know when it is worthwhile to spend money traveling for a story? The tab for a trip to New York is almost inescapably $1,000, including train (about $400), taxis (about $100) and hotel (typically $300-$400). The last and most important factor in my decision to go was that the publicist said it was OK if I brought a friend. I like parties and they are part of my job, but an introvert in a room full of strangers is always better off with a friend at hand. My friend EJ is especially good at this kind of thing: She’s a tall, friendly New York City lawyer with a lot of funny jokes up her sleeve — and unlike me, she always has something to wear, complete with matching shoes. She was game. “You are one of the only people I would do this with,” she said. I’m not exactly sure what she meant by that but I took it to mean that I bring out her adventurous steak. 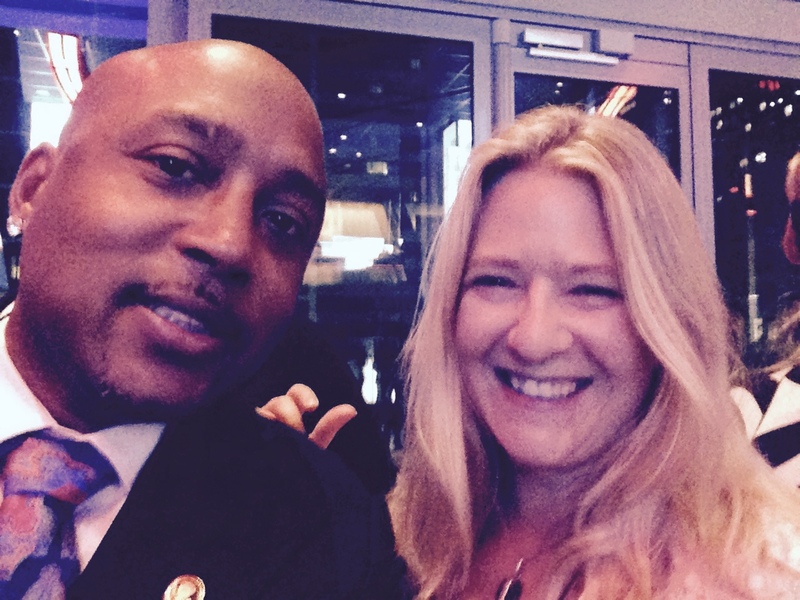 EJ was in for this particular adventure partly because her teenage son likes Shark Tank so she wanted to get selfies with the stars. As usual, the people working the coat check looked askance at my computer bag, which is about 10 years old and weighs about 30 pounds because in addition to my computer it holds a couple of books I am reading, a few notebooks, some pages of a book I’ve been trying to write for a decade and all the other sorts of things a working mother might have, like lipsticks, homework assignments and spare headphones. It’s a good thing to have a bag that sticks out in its disreputable state, though, because I very often lose the claim ticket for my bag immediately after I drop it off. 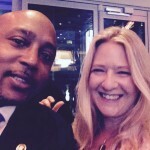 After EJ took took her pictures, I chatted with Daymond John. When he heard that I’d come from Washington and planned to take the train home that night, he looked skeptical. “Check the schedule,” he urged practically. “Nah,” I said. I’ve traveled back and forth to New York hundreds of times, and I was sure there was a train leaving at 11 or 12. As the evening wore on, I had a couple of the signature shark drinks, which had candy sharks swimming at the bottom, and a few nice conversations with entrepreneurs, including the couple that I ended up writing about a few days later in How a Texas Couple Started with $500 and Built a $1 Million Shark Tank Winner. “He is such a media whore,” John joked. The party organizers gave us bags of goodies, most of which I donated to a yard sale collecting money for a nonprofit called Huru International, which helps girls in Africa who don’t have money to manage their monthly periods. But I kept the Wicked Good cupcake-in-a-jar for my girls. We stepped out into the New York night air. We stopped at Pie Face. I checked the train schedule. Needless to say, John had been correct: there was no train back to DC. I wasn’t the only one who’d had an adventure that night: As I walked through Penn Station I noticed about a dozen other women in cocktail dresses, all making their ways back home.